The psychological and physical aspects of love. rachel wehan, Hi, my name is Ray. I grew up in Pittsburgh and long for adventure + wholeness. I express myself best through words + try to bring ordinary events to light. WARNING: bad joke. What comes in a pair, has a tongue, but can’t talk? Shoes. The addiction is real. When asked why I have so many shoes, my famous response is this, “they don’t get affected by calories, so you always feel fabulous.” Shoes that fit you on a Thursday will still fit you on a Sunday three months later. They’re the finishing touch to any outfit, + sometimes even when they’re high as hell water + pointer than the end of your winged liner; beauty is pain. On Saturday when I had some time to kill at the mall before babysitting, naturally I snuck up to Macy’s to check out the shoes. Thirty minutes + two pairs later…I did as any women would do, because, clearance + shopping math. You know, the whole “I had to spend 50 more dollars to get free shipping, so I did. BUT now the $12 shipping is free” kinda speech that we’ve all given to the male population, am I right? We all have addictions, some healthier than others: clothes, food, drugs, people. But should we become addicted to people? Is that healthy or unhealthy? When I look back on stories I’ve heard from colleagues, the “toxic” relationship seems to be more apparent than not. The reason for romantic relationships appearing as this liberating feeling is from the root of your feelings; fear, need, lack, + and maybe incompetence. In addition to the physical aspect of love, there is a psychological aspect as well. Physical level: You are not a whole. You are a women, or you are a male, aka one half of the whole longing for the other half to complete the circle. Of course intimacy is the only way to feel 100% close to another, catching a glimpse of wholeness. Psychological: As long as you are identified with your thoughts, you will long for the outside world to define who you are: success stories, failures, beliefs, social status, money. This is from your EGO. So we long for this feeling + then boom. THE. ONE. comes along. He / She appears to be the answer to all your questions, fears, + idea of a lover. For some people, the issue becomes this: that person is now who you identify yourself with + your world now has a center: your loved one. But what happened to those feelings that you were feeling a week ago, have they subsided? Disappeared? Not usually. They’ve just sunk below the surface. When this is the case, you end up in a love/hate relationship. However, love is not a two sided feeling. It does not have an opposite, and if it does, then it is not love, it is an EGO demand reaching out for a need that the lover temporarily meets. If you are in a relationship + experiencing love/hate, it is not love, it is an ego-attachment. Then a few weeks go by, maybe a few drunken fights, and what? The relationship goes south. You start to feel disappointment, and just like any other addiction, there comes a point when it no longer works for you. The problem is you start to think your partner is the cause of these feelings, but in reality, they are just bringing out the feelings that are already in you. So how can you become ready for a relationship, or a healthy addiction. Awareness. Be aware of your feelings + use your own strength + resources to cure them, not something or someone else. Communication. A partner is there to help talk about these things, to cause new fiery feelings that you haven’t already felt within you. 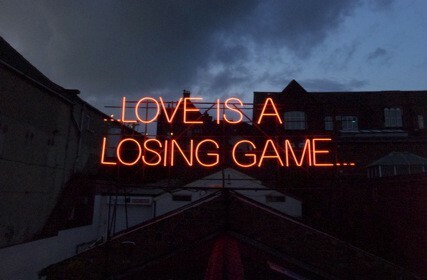 The real reason I was prompted to write this posting is because I saw a picture on Pinterest that said “Love is a losing game.” Love is a state of being, it is not outside; it is deep within you, you can’t lose it + it will never leave you. Love does not have to be with a romantic partner, love can be the sensation you get from trying on a new pair of shoes. I’m no love guru, and although I’ve been blessed with an amazing circle (family, friends, boyfriend), I think that everyone has used a vice before rather than facing the monster they’re scared to fight. Let’s turn our vices into virtues. Originally published at raywordpresscom2016.wordpress.com on February 8, 2017.